For decades, companies have been using Lean Manufacturing and Six Sigma to develop, produce and deliver near-perfect products and services. In the most recent survey of companies adopting Six Sigma, 53 percent of Fortune 500 companies are currently employing Six Sigma, saving an estimated $427 billion over the past 20 years. These results are impressive. Recognizing the enormous and limitless potential of Lean Manufacturing and Six Sigma, the Harrison Group Consulting (HGC) became the first to introduce and apply Lean Six Sigma to accounting and financial reporting which we coined Lean Six Sigma Finance And Accounting. While businesses dramatically grew in size and complexity, accounting, in its present form, lagged behind. As companies evolve to become more competitive and nimble, the accounting and financial reporting functions must keep pace as well. LSS Finance and Accounting represents a radical but necessary advancement for the accounting profession. Companies have greeted LSS Finance And Accounting with a healthy dose of skepticism. After all, Six Sigma and Lean Manufacturing were developed for manufacturers, not for service providers, more specifically accounting. However, the processes and metrics employed by Six Sigma and Lean Manufacturing prove readily adaptable to the Corporate Finance function. Many companies have adopted Lean Six Sigma methodologies to their Corporate Finance function yielding substantial cost savings, shorter closing cycles, and more responsive financial reporting. LSS Finance And Accounting, like its two predecessors, is most effective when judiciously and strategically implemented to identified, problem areas in Corporate Finance. The Harrison Group Consulting is uniquely qualified to manage your LSS Finance And Accounting engagement. Our consultants brings to each LSS Finance And Accounting engagement both Six Sigma and Lean Manufacturing experience, as well as, a wealth of knowledge in auditing, accounting, regulatory compliance and taxation. We encourage you to learn more about LSS Finance and Accounting by contacting a HGC associate. Lean Manufacturing originated from Toyota Motor. 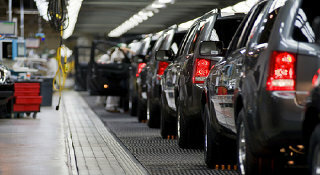 Image of a Japanese car assembly line. LSS Finance And Accounting adopts methodologies perfected by Lean Manfacturing and Six Sigma, and applies these methodologies to the corporate finance and financial accounting function. Through continuous innovations and improvements, standardization, and training, companies shorten the financial reporting cycle by eliminating duplicate and inefficient accounting processes, reducing financial reporting errors, and delivering more responsive financial data. HGC developed LSS Finance And Accounting to address three pressing issues that Corporate Finance, particularly accounting and financial reporting, faces: 1.) Avoidable accounting errors leading to financial restatements. 2.) The investingl public's calls for more responsive financial reporting and greater financial transparency. 3.) The chronic shortage of qualified accountants.